One Room Challenge, Spring 2018, Week 6: The Big Reveal of #projectontheflydining! It's here, it's here! 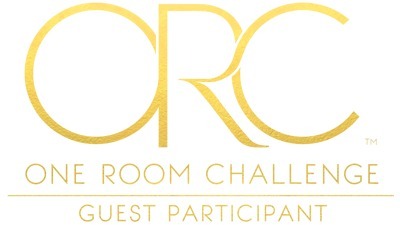 Today is the big reveal for those of us guest participants in this spring's One Room Challenge -- an amazing (and slightly insane) design event encouraging designers, decorators, bloggers, and design enthusiasts to redesign a room (from the first idea to the last steamed textile) in six weeks. Linda Weinstein of Calling It Home started this project many years ago, and my all-time favorite shelter publication -- House Beautiful -- is the media sponsor. Twenty featured designers and over 200 guest posters were involved in the ORC this season, and there are some knockout projects and stunning before-and-afters, so be sure to take some time in front of your screen over the next few days and take it all in. Inspiration abounds! If this is your first time visiting me, welcome! 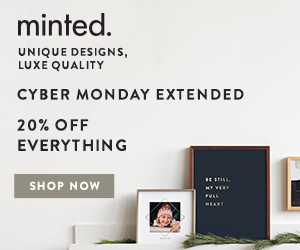 I'm a Boston-based designer focused on creating beautiful, affordable spaces that incorporate all the messiness of real life. I started my business in 2014 at the ripe young age of 41, after spending nearly twenty years in public relations. While I still feel like I'm fairly new in the business, I've had some amazing opportunities in the four years I've been around, and I count myself lucky to be a part of the most wonderful, dynamic, supportive design community here in Boston. I'm glad you've landed here, and hope you'll come back again. Week 4: Help Is On the Way! As you may remember way back from the first week, I selected the dining room to be redone. 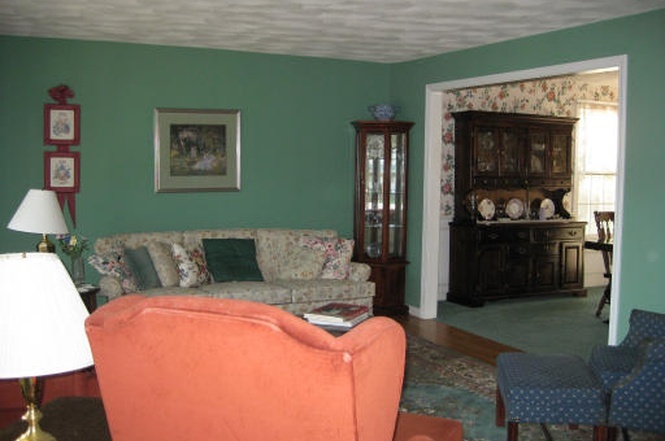 When we first bought the house, the formal living room (which became our dining room) was dated with a capital D-A-T-E-D.
Before, from the real estate listing in 2010. 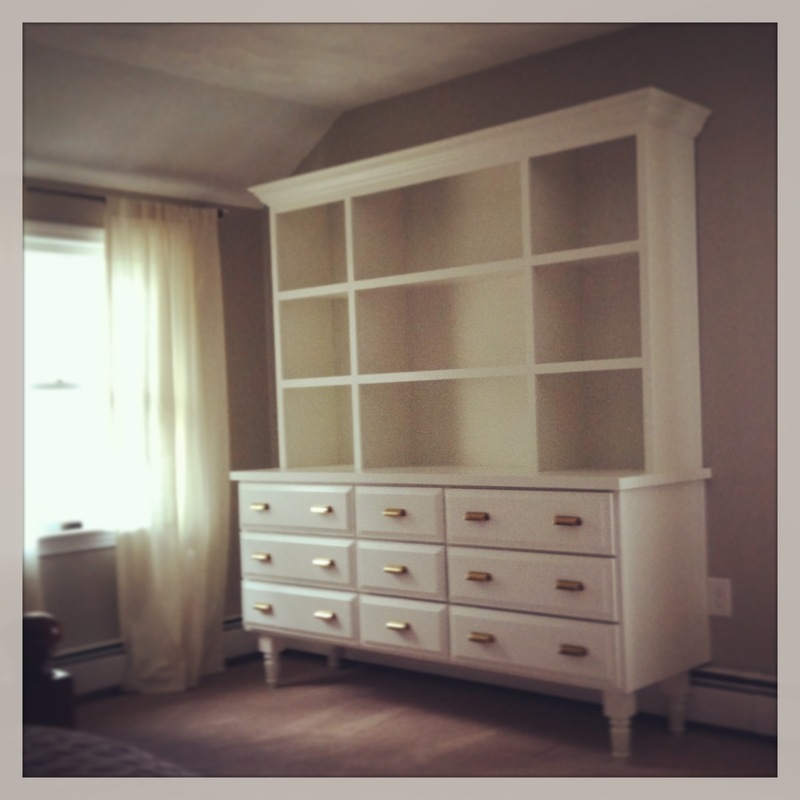 We did a quick paint job, added some crown moulding, and had a beautiful custom built-in made, but it still wasn't singing to me. Just before starting the ORC, furniture was gathered in the middle preparing for our painter. So for eight years, I lived with it in limbo, until I got this beauty for my birthday in January. The object that inspired the entire room: the High-Five Coper Bowl from Jill Rosenwald. 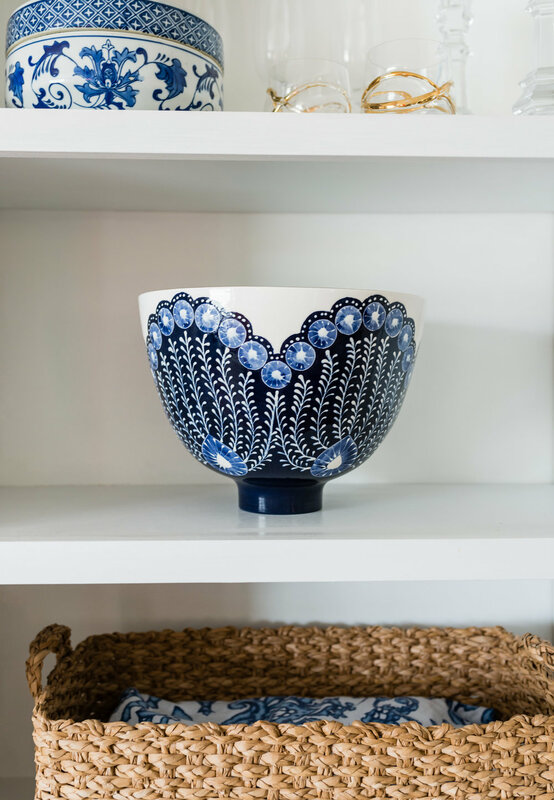 Once I received this gorgeous piece of Jill Rosenwald pottery, I knew I needed to change the dining room. Those beige-yellow drab walls did NOT cut it as a backdrop for this masterpiece, and although I didn't know exactly what I was going to do, I knew what direction I was going to go in. Once the ORC started, decisions were made by gut and intuition (hence, #projectontheflydining), and ultimately, I think it turned out pretty well. What do you think? The first big decision I made, after coating the room with Simply White by Benjamin Moore, was what I was going to do for the window treatments. I usually visit the Boston Design Center for my textile sourcing, but given our limited timeline, and the client work I had on the table, I hit my local Calico shop for one-stop fabric selection and fabrication. I knew I wanted something graphic and blue, but wanted it to be a timeless pattern. As soon as I spotted "On Key" by Waverly, I knew it was the right one. The fabric is upholstery weight, making for thick, luscious drapery. I chose a cartridge pleat (see in next shot) which allows for some movement, rather than making the panels entirely stationary. The window treatments were my biggest investment (a little extra because I had them rush the labor), but so worth it. The next big decision I made was the light fixture. I had visited Light New England -- a favorite local lighting showroom -- a few weeks prior to the start of the ORC with a client, and fell in love with this linear lantern. 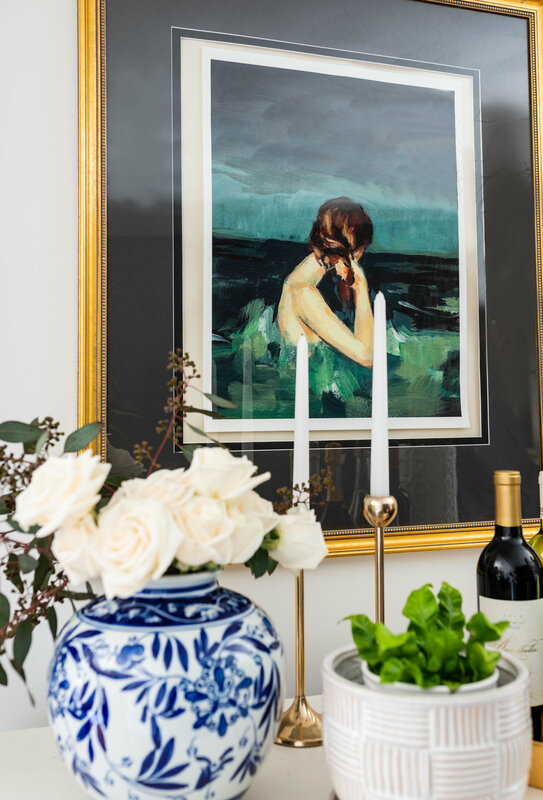 It felt casual, yet elegant -- exactly what I was looking for in the feel of the room. I debated between the gold finish and the black finish, but ultimately felt the room needed a good hit of black (doesn't every room?) that tied in beautifully with the table legs and corner chair. 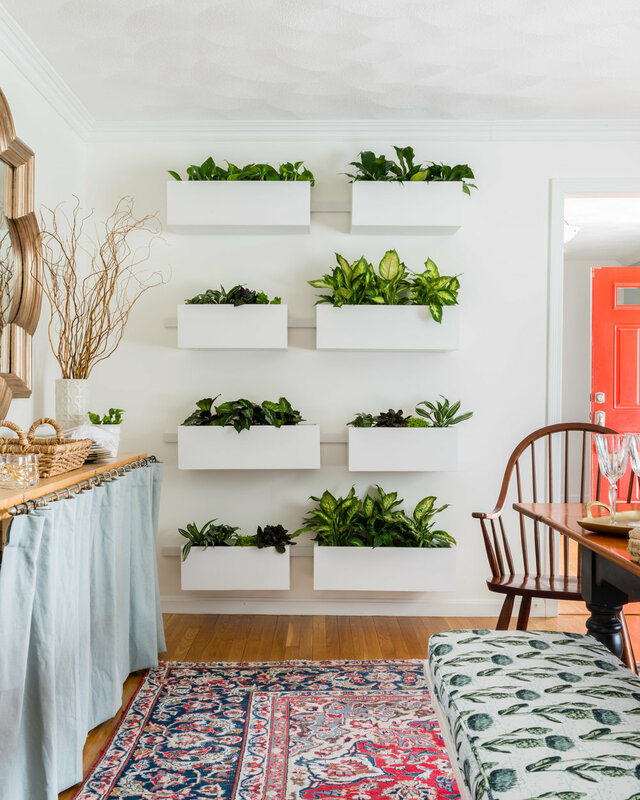 The biggest on-the-fly decision I made was installing a living wall in the dining room. I had already talked to my carpenter about recreating the wall that Ana and I installed in our showhouse room for my own living room, but as it got closer and closer to completion and installation date, I realized it would be an absolute showstopper if we installed it in the dining room instead. So we did, and it is! I've always struggled with what to do with this wall -- feeling like it needed a giant piece of art, but never being able to decide on what piece I wanted to invest in -- so this is the perfect solution. And yes, all the plants are real! 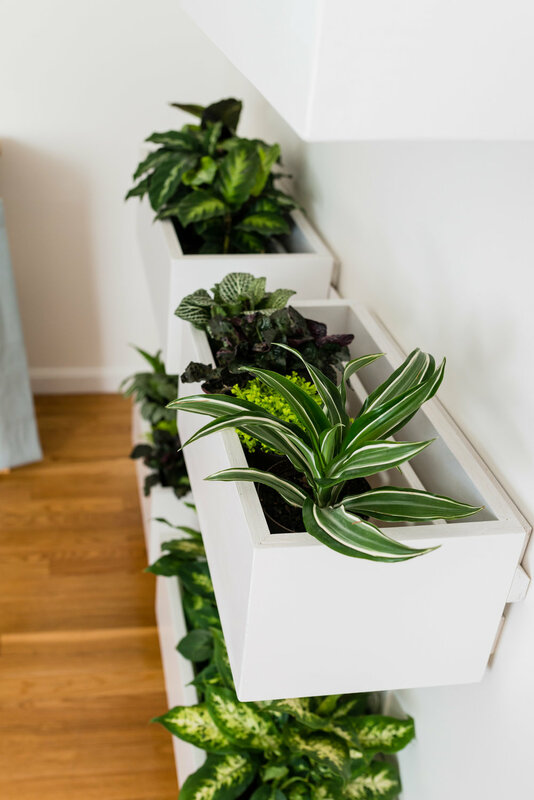 They are indoor, low-light varieties, and as long as I water them once a week, they'll stay alive and well. One of the things I love most about this room is the pattern mix of the bench cushion and the vintage rug. If you followed along for the past five weeks, you know that I was considering swapping out the rug for something more neutral. I was back-and-forth on it, but then I spotted a shot from Candis and Andy's book, and it helped make my decision a whole lot easier. It was like a message from the universe telling me to keep it (and I don't ignore messages from the universe). The cushion fabric is Root Cellar Designs' Espalier Thistle pattern, and it's printed on their Porch indoor/outdoor textile, making it perfect for a dining bench. I love the modern botanical print, and the colors pull all the greens and blues from the room together beautifully. When it comes to the furniture, you may have noticed that I didn't get rid of a single piece. 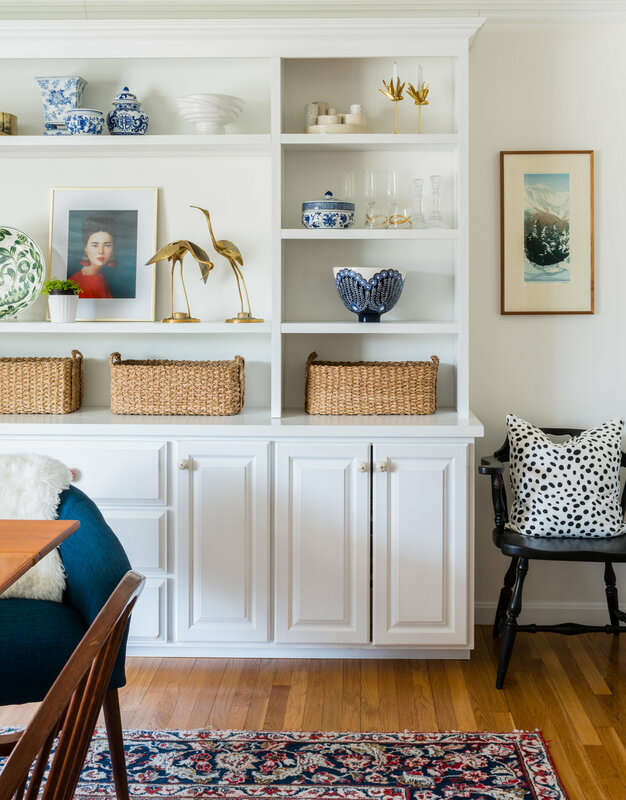 Prior to this challenge, I was ready to scrap it all -- the table, the chairs, the chest of drawers, the IKEA shelving unit that we were using as a sideboard. But after this challenge, I don't want to change a single thing. I've fallen back in love with our cherry farmhouse table, Windsor chairs, and cheap end chairs from Target. 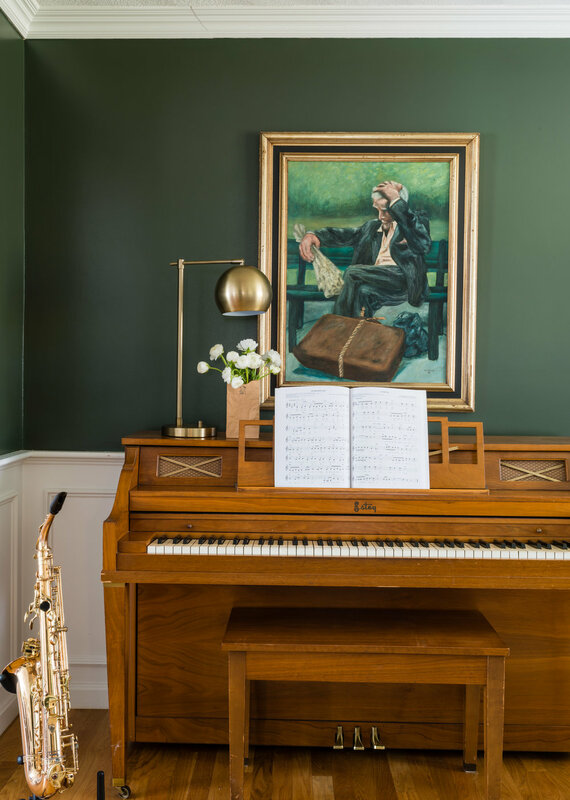 The bench feels like a new piece with a quick coat of paint and cushion, and the antique wood box feels like the perfect touch of history in the room. The IKEA shelving unit got a quick upgrade with a last-minute table skirt made from the old linen/cotton drapery. Even the chest of drawers, which up until the night before the photoshoot I had planned on painting navy, feels perfect in the space. Finally, let's talk ART. There are only a few pieces of art in this room, but without them, particularly the portraits, it would feel entirely different. For those of you who follow me on Instagram, and have seen my #startwithart series, you know I'm a fan of Janet Hill Studios. I've had this piece for a few months and wasn't sure where I wanted to put it, but as soon as this challenge started, I knew she would take center stage. Her statement earrings are just perfect , and the hit of red adds just enough to connect the rug to the rest of the room. I love her so, so much. The other piece, from Clare Elsaesser, is one of my long-time favorites. I've had her for years and years, and she's moved around the house a lot. I'm a big fan of the ocean, but am not always drawn to seascapes. This piece captures that love while feeding my attraction to portraits. It's mysterious and lovely. Finally, although technically not in the room, this guy in the far corner can't be ignored. I got him at an antique shop in Culpepper, Virginia, only after NOT buying him, and then frantically calling the shop once I got home realizing what a big mistake I had made. Purchasing him inspired the first change to this downstairs space (those walls were originally a dark coral, but he told me he needed dark green), and the room flows so beautifully now. 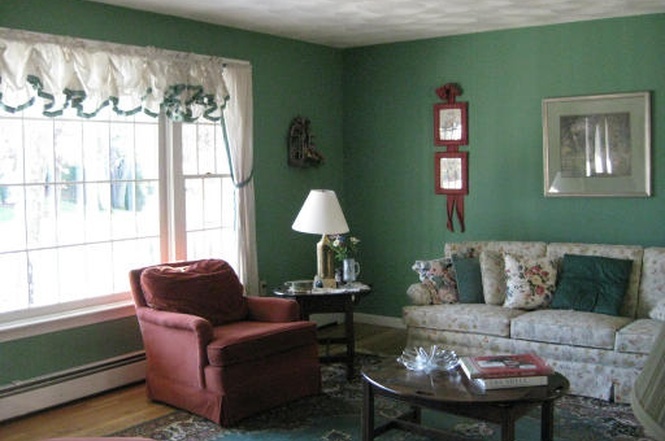 I know everybody loves a good before and after, so here are a couple of pretty dramatic ones, comparing today's room with the original real estate listing photos when we bought the house. In Week Two, I outlined how I wanted the room to feel when it was done. This was key, since I didn't have an actual plan, so the list of words helped guide my decisions as I went along. WARM, ELEGANT, SPACIOUS, COZY, FEMININE, NOT TOO FEMININE, CLASSIC, THOUGHTFUL, UNEXPECTED, NEW, TIMELESS. Before signing off, I want to say a giant thank you to the industry partners who helped me execute (and capture) this room so quickly and beautifully. Thank you Linda, House Beautiful, Candis and Andy, the featured designers, guest posters, and readers who have made this challenge so fun to do and to follow. Here's to Fall 2018! All photos, with the exception of the "before" shots, taken by Jessica Delaney Photography. 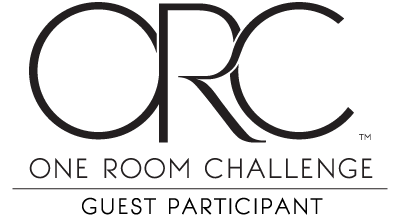 Have you guys heard of the One Room Challenge (ORC)? 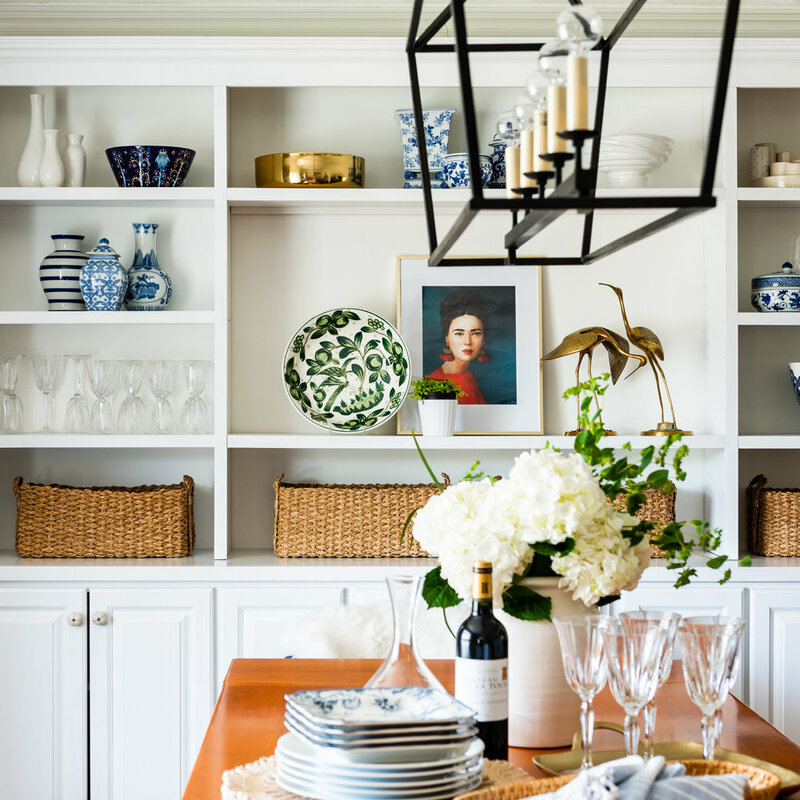 About seven years ago, Linda Weinstein of Calling It Home started this sort of blitz-decorating challenge, calling upon readers and fellow bloggers to make over a space of their choosing in a mere six weeks. 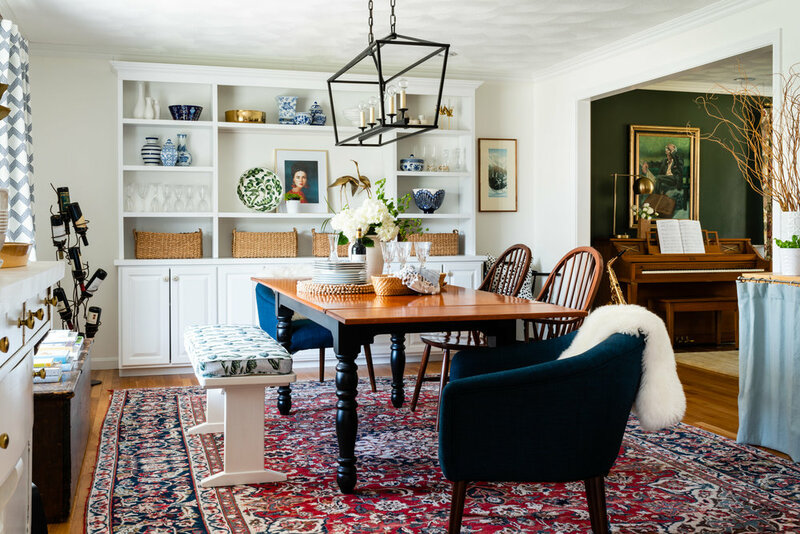 Fast forward, and it's now a design movement, sweeping across the internet every April and October with 20 featured design bloggers reimagining rooms with some sweet support from awesome sponsors, and an amazing media partner (and my favorite shelter pub of all time) -- House Beautiful! The community element is still intact, with a whole host of readers and fellow bloggers chiming in as guest participants with their updates on the ORC website and in every corner of Instagram. I've always been intrigued by the ORC, but every time it rolls around, I've never been able to make it work. Well, NO LONGER! This year, I decided to add a tab to my to-do list and throw my hat in the ring as a guest participant. From now through mid-May, I'll be posting updates every Thursday on my project; I hope you'll follow along. For anyone who has made over a room to completion, you know six weeks is TIGHT. Regardless of whether you're buying everything new and working with contractors, or using what you own and doing all the labor yourself, that timeline leaves no room for error. The best way to get it done is with a locked-and-loaded design plan, but as is typical of interior design pros when designing for themselves, that whole plan thing? Not always in the cards. Many of us have houses akin to the Shoemaker's children...the ones that had no shoes. Our houses? Well, they never seem to be done. I hope the ORC is going to help me focus on something I've wanted to do for a long time: finish my own house. But first, let's start with the dining room. Yes! The dining room! My house seems to be a prime gathering place for our family -- six parents (including steps), ten sibs (including partners), five nieces/nephews, and our own two kids require a decent amount of seating any time some combination of us get together. I also love a good party, and try to host a few -- small and big -- each year. All that to say that what was considered the "dining room" when we moved in was NOT going to be big enough for our purposes. Oh, it was also ugly as sin. Ready? This was the real estate listing shot from when we bought the house eight years ago. No, no...not the 1980s...2010! And yes, that's CARPET. Anyway, we knew pretty early on that the dining room wasn't going to work for us, size-wise, so we decided to settle into what would've been the formal living room (which we had no use for). This was it...again, 2010, people. So this is where we are. A drastic improvement from the state of affairs in 2010, but ready for an update. After eight years, the Ben Moore Powell Buff walls are getting to me, the rug feels garish, the light fixture feels cheap (which it was, by the way), and the mish-mash of furniture feels really mish-mashy. And also, notice that gorgeous bowl to the left? This one? This bowl is pure inspiration. This bowl needed to have a home that was worthy of housing it. This bowl RUINED me. Flat. Done. Finis. You see, I would've been content living with my dining room as it was for a bit longer, but then I got this amazing Jill Rosenwald bowl for my birthday in January and now I'm redoing my dining room because of it. 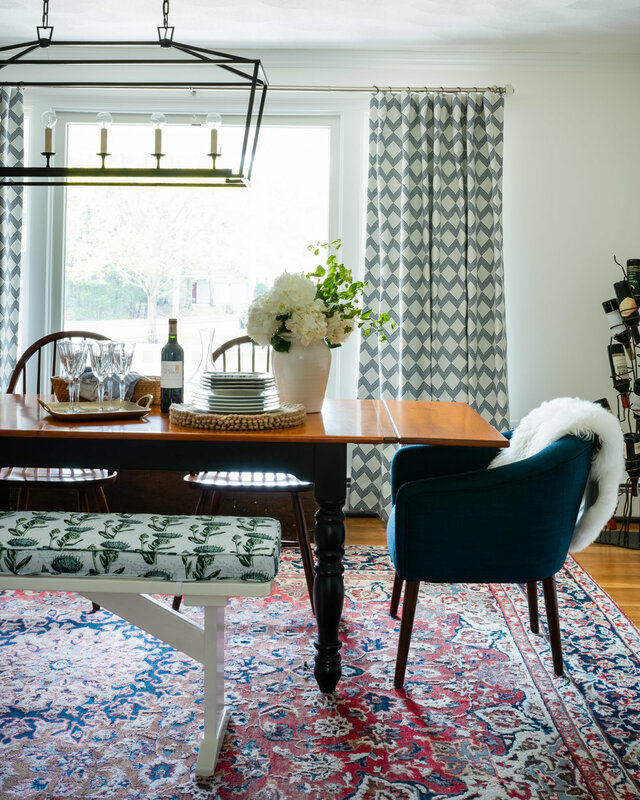 * So if you're looking for fancy inspiration pics -- how I want my dining room to look when this challenge is all over -- look no further, because it's all about this beauty. Next week, I'll share a bit more about my...um...plan for how this is going to all roll out, but suffice it to say, it's not all determined, and it's not going to be smooth sailing. I will be making decisions on the fly; working with some pros, but doing a lot myself; reusing things I already own; and investing cold hard cash only in key areas, because the reality is, I don't have a big pot of money sitting around to redo this (or any) room. 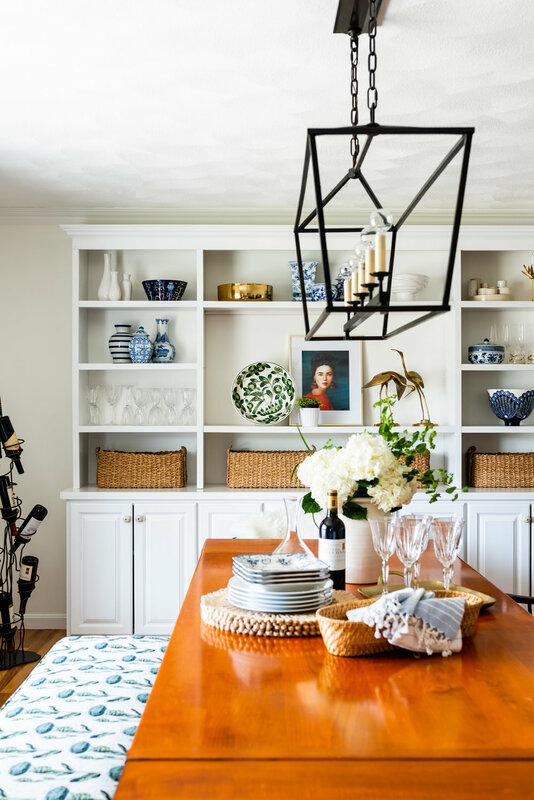 Check back every Thursday, and be sure to check in on the progress of the featured bloggers (including my friend and fellow Boston Show House designer, Kelly Rogers!) and the rest of the guest participants at the main One Room Challenge site! Also, if you want to see my progress on Instagram, follow #ProjectOnTheFlyDining. See you in a week! Over on Boston Mamas, my Use-What-You-Own Hanukkah Table Setting is featured. Fun! Central to the design are these pretty dipped vases. They're super easy to make, customizable for any holiday or event, and usable long after the celebration is over. Clean your vases thoroughly with soap and water. Dry, then wipe down with rubbing alcohol. Place a protective covering on your work surface. Cover a baking sheet or tray with tinfoil. 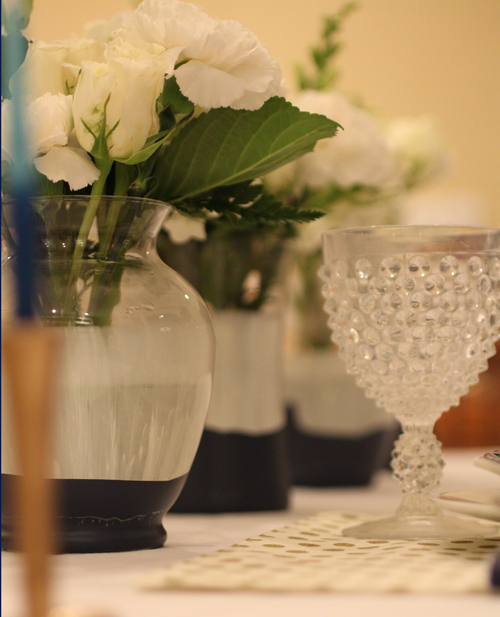 Dip the vases, bottom-first, into the white paint. Hold each vase in the paint for about 10 seconds, then pull out and let the paint drip off. Set down on tinfoil-covered baking sheet or tray; bottom-down for a clean top edge (as I have done in this example) or top-down for a dripped edge. Let dry for one hour. Create a "bucket" with your gallon freezer bag by folding the bottom corners of the bag onto themselves. Secure with tape. Fill your "bucket" with your second paint. Dip the vases into the second paint. Swoosh the paint around so you get edges that have some movement, then pull out and let the paint drip off. Set down on a newly-tinfoil-covered baking sheet or tray; again, bottom-down for a clean top edge or top-down for a dripped edge. Let dry for one hour. Wipe down bottoms if there is a thick layer of wet paint. Fill with flowers and enjoy! Please note that the paint WILL COME OFF if these vases are put in a dishwasher or washed by hand with too much vigor. Rinse and dry carefully to make them last! 1. BESTA Shelf Unit - Used as a museum store display, intended to hold living room electronics, purchased for my son's excessive library. I no longer want to poke my eyes out every time I go into his room. 2. SOCKER Vase (set of 2) - got them in the coral and aqua (couldn't resist). 3. RENS Sheepskin - graces the back of my office chair. 4. UPPTACKA Shopping Bag with Wheels - perfect for flea- or farmers-marketing. 5. EIVOR Throw - super cozy, light, and graphic. 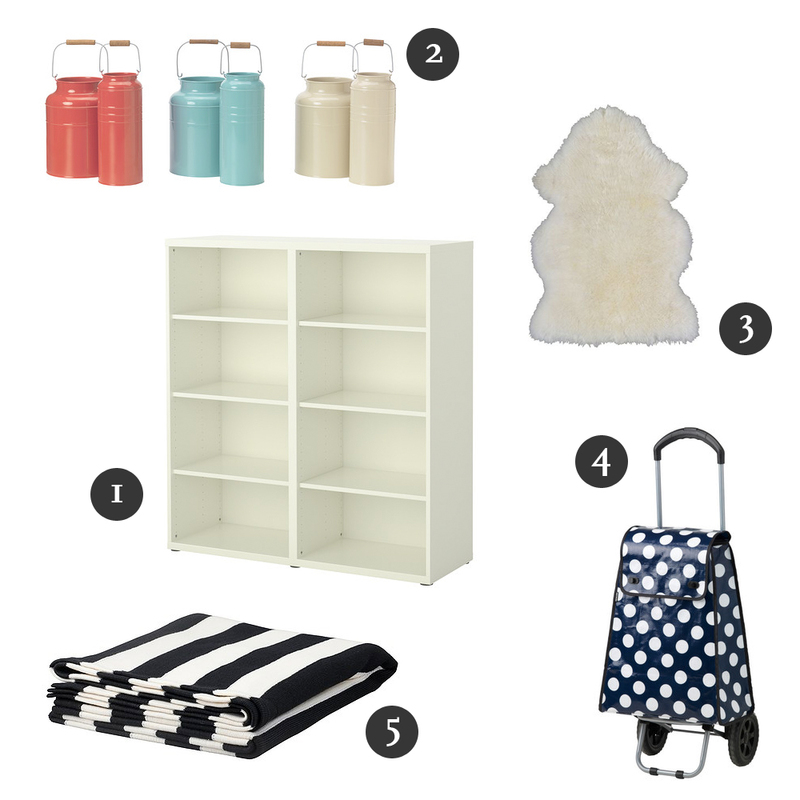 What's your favorite IKEA item? Tell me below or on the Mudroom Boston Facebook page. You're a fan, right? 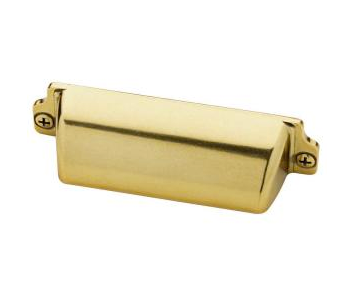 Looking for pretty, inexpensive, brass drawer pulls? Furniture image by Paige Lewin. Furniture design by Paige Lewin in collaboration with Bill Jones of Fresh Air Millworks.